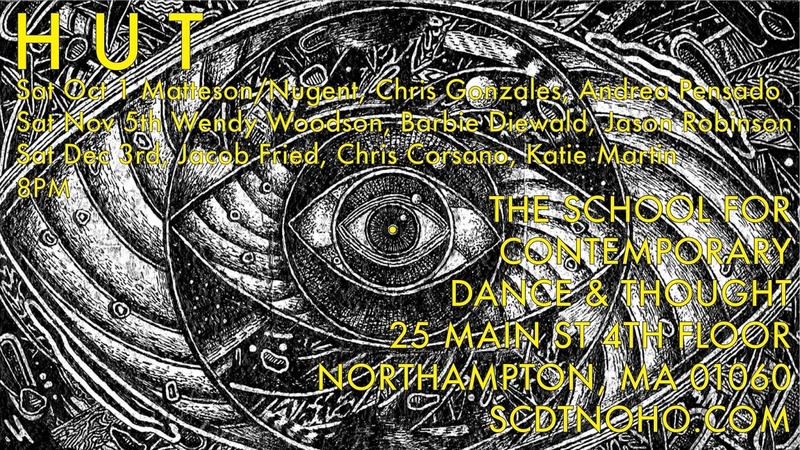 HUT Series returns to SCDT to kick off a second season with an evening of contemporary sound, movement and poetry. Andrea Pensado works with sound as a performer, improviser and programmer. She studied in Argentina and Poland where she graduated with honors. She studied composition with Barbara Buczek and Boguslaw Schaeffer and computer music with Marek Choloniewski. Pensado plays solos and collaborates frequently with other improvisers. Her more stable groups are Phurnne (a trio with Jenifer Gelineau and Stephanie M. Germaine), Los Condenados (with Walter Wright, Jules Vasylenko and Chris Strunk), Bats From Pogo (with Walter Wright) and Sheer Anxiety (with Chris Strunk). She performs extensively across the United States and has been featured on numerous occasions in Europe and South America as well. The performances take place in all sorts of varied venues from regular concert halls to art galleries, clubs, lofts, basements, record stores and "house-shows". She has releases with Zeromoon, Feeding Tube Records, YDLMIER, Hidden Temples, Pan y Rosas, LITL and Ayurvedic Tapes. Since 2010, she runs Sonorium, a quarterly series of experimental music in Salem, MA. Pensado uses Max as her main programming tool. The voice is constantly interwoven in her music. Occasionally, the combination of the performance situation, the often abrasive sounds, the irrational use of the voice and the inherent uncertainty of improvisations contributes to discoveries of unknown places in her mind. https://vimeo.com/65766994Paul Matteson and Jennifer Nugent are Bessie award performers and have been collaborating on dances for the last fifteen years. They are currently working on a new evening length duet, Note the Self, with composer Ted Coffey. Paul joined Amherst College and Mount Holyoke College in the fall of 2012 as an Assistant Professor of Dance and is a 2014 Massachusetts Cultural Council Award recipient in Choreography. Jenn teaches regularly in NYC and is a teaching artist at Smith College and Amherst College. Chris Gonzalez is a 23 year old actor,theater maker, musician, poet, and educator raised in Northampton, Massachusetts. Chris has opened for International Slam winners Saul Williams and Shane Koyczan. He has featured at Amherst College's Multi-Cultural Theater Conference, MCLA and Equarox:Give Life to the Arts, and Northampton Arts Trusts "Outside the Box" series. 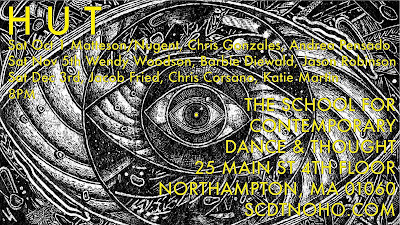 Chris used to co-host Northampton Poetry and currently organizes readings to spotlight local poetic talent. Chris frequently leads poetry workshops for students at Northampton High School, where he also coaches a youth theater education group.